Uttar Pradesh State Road Transport Corporation (UPSRTC) has opened the application process today for 333 Samvida Conductors for the Saharanpur unit. The pay scale will be according to the potential of the candidates as analysed during their selection. The selection process will be on merit basis. The merit list will be prepared according to the marks the candidates secured during their higher secondary education. Reservation will be provided in seat allocation for the reserved categories. The application process is online through the official website. You may pay the examination fee through the online payment gateway on the website through your debit card, credit card or net banking. ITI trained candidates will be preferred. 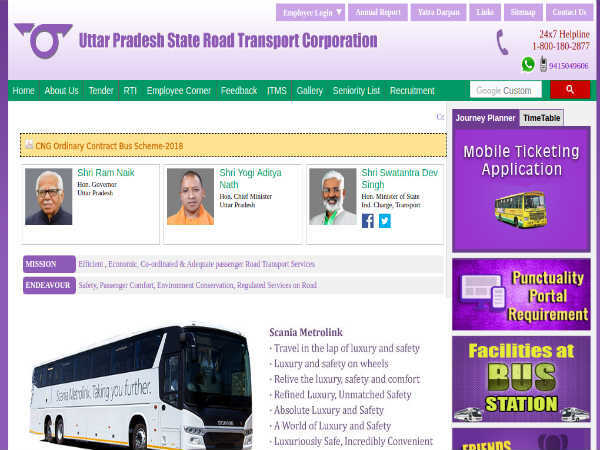 Step 1: Log on to the UPSRTC official website. Step 2: Under Recruitment, click on Saharanpur. Step 3: You'll be redirected to another website. Click on the link to fill the application form. Step 5: Upload the necessary documents. Step 6: Click submit button. Step 7: Pay the application fee and follow the subsequent pages to complete the application process. The hard copy of the application form can be submitted in any of the nearest depots.